It’s time to rediscover the green bean! Green beans get such a bad wrap. Most of us grew up eating either the canned or frozen variety which was probably overcooked to the point of only a mushy semblance of a string bean. Thankfully, we now have access to fresh green beans as close as your nearest farmers market. When choosing green beans at your farmers market, be patient and take a little time to select individual green bean instead of grabbing large handfuls. Trust me, the extra effort will be worth it when chow time comes. Here are a more tips on how to choose, store and prepare green beans. Now that you have your fresh green beans ready, here’s a quick and easy recipe that’s perfect for your next meatless meal or side dish. I also love this dish because it’s a great alternative to a traditional leafy greens salad. For a protein boost alternative, add a can of tuna. Give it a try and let me know what you think! In a sauté pan, add olive oil, shallot and garlic and sauté on medium heat for one minute. Add dry white wine and reduce. Blanch green beans in a pot of salted boiling water for two minutes. Drain and transfer to ice bath. 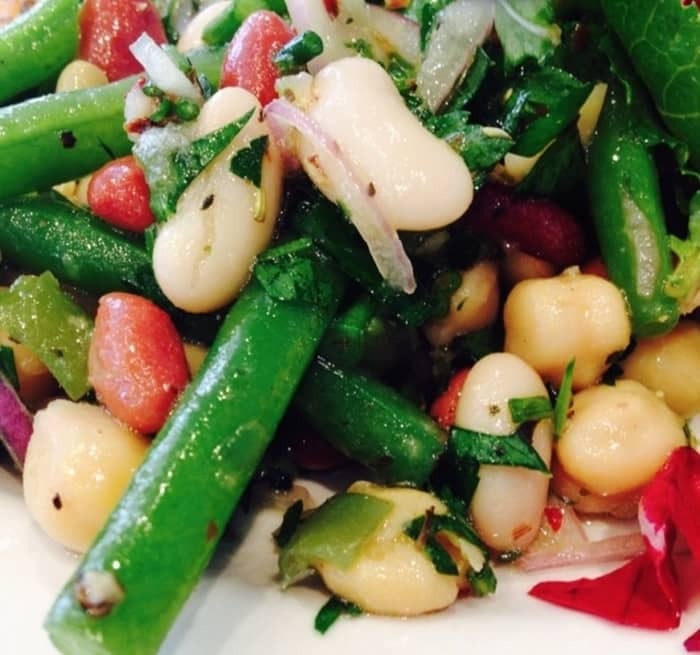 In a bowl, combine chickpeas, cannellini beans and habichuela beans. Add green beans, shallots and garlic. Toss with parsley and finish with olive oil, salt and lemon zest. Cover and refrigerate for one hour. Serve cold.